PEANUTS GALLERY EDITION GICLEE - LUCY 2006 This is a Giclee on Canvas, expertly stretched in a 3 inch deep gallery wrap. No need for additional framing. 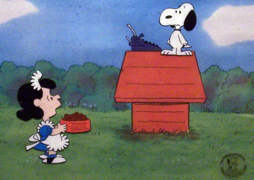 Depicted here is Lucy yelling at Charlie Brown “You Blockhead”. PEANUTS GALLERY EDITION GICLEE - PEPPERMINT PATTY 2006 This is a Giclee on Canvas, expertly stretched in a 3 inch deep gallery wrap. No need for additional framing. Depicted here is Peppermint Patty at her desk. PEANUTS GALLERY EDITION GICLEE - SALLY 2006 This is a Giclee on Canvas, expertly stretched in a 3 inch deep gallery wrap. No need for additional framing. Depicted here is Charlie Brown’s little sister, Sally. PEANUTS 1980’S Animation Drawing of Woodstock & Two Pals Building a Duplex Birdhouse! PEANUTS 1980’S Great production Cel of Sally with a Rather Cross Expression. 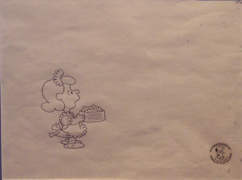 PEANUTS 1970’S Production Cel of Lucy. Ref. #L-99. This Piece Comes with a Matching Animation Drawing. PEANUTS 1970’S Production Cel of Lucy. Ref. #LU13. PEANUTS 1980’S Production Cel of Peppermint Patty Wearing Thongs. She is Very Angry! !